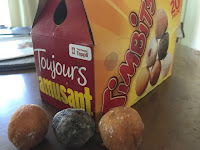 Thank you Canada for Timbits! I stand on guard for theeeee..seee Timbits. Does anyone want to know the status of my Citizenship application? Me too. They keep sending me auto-generated emails saying someone has looked at it but there’s no new developments. When I used to work for Big Oil we had a system we used for customer complaints and although I would often work them after hours to get my bin clear there were some people who would go in and just change the status to buy themselves more time. I’m suspecting that is what is happening in my case. I am getting the groove of Texas I think, or Houston anyway and its a good thing because one of my last remaining Canadian friends is flying this beautiful, sweltering coop and is headed back to cooler heads. I mean, climes. Colder climates. Back to Canada, eh? She brought me back some Timbits and just hearing her talk about stopping at Shoppers, and eating at Swiss Chalet makes my red and white heart beat a little faster. I miss home. Timbits help. Also I just found out the main road I drive almost every day, 1488, could be a Ku Klux Klan reference. Why is clan spelled with a K or a C? Did they take a vote on that? “Jimmie it’s ALLITERATION if we spell it with a K.” Or maybe it was unanimous. Where was I? FM1488. Apparently 14 and 88 have special significance to the white supremest movement. Fourteen being the number of words in their, what, mission statement? Motto? Created by David Lane. Eight is the number H in the alphabet, 88 standing for HH, or, you guessed it, Hail Hitler. I know. I’m hoping it’s just a coincidence. How did I find out about this? NPR people. It isn’t just for news. Then I googled it, of course. Creepy. And I hope just coincidence. Something I'll be looking into. Apparently snake sightings are on the rise around the neighborhood. I can confirm this because I saw TWO snakes crossing the road at night in the last week. One I had to veer around the tail on my side of the road and her head was already off the road at the other end. So. So big. So, so glad I was in a large, totally closed in vehicle going 40 miles an hour. The other snake raised its head and hissed at my headlights but it was only the length of my arm so, just a baby maybe. A mad baby. Then while I was playing with the kids outside I saw a green snout and two black eyes staring at me from under a rock by the back door. I rushed the kids inside. Once safe inside Ellie helpfully pointed out in my rush to get them in Benji had dropped his Teddy on the ground. It lay there, close to the rock, forlorn. Abandoned. Benji began to whimper. They seemed to sense the danger because neither one fought to go back outside. I had to get Teddy though. I steeled myself, pulled on my big girl pants, then ran like a maniac out the door, grabbed the teddy, and LEAPT back to the door, slamming it behind me. Once everyone (and every Teddy) was safe and the adrenaline lowered and my heart moved back into my chest from my toes I realized I had to find out if it was really a snake, or a harmless toad. If I waited for Bill to deal with it, he’d probably just kill whatever was in there and call it fair. So I grabbed a big bucket of water and dumped it (carefully) from the door, then slammed it shut and waited. About 30 seconds after the deluge a very irritated looking toad hopped out of the hole. He glanced my way, shook his tiny wet fist at me and sauntered back into the high grass, head held high. Phew. Then I had to change my big girl pants. Oh, and Hurricane season started yesterday. As long as it doesn’t rain snakes, I’m alright. That’s not a thing right? Texans? Anybody? It may be time for a trip back home until the snakes go away and the weather isn’t trying to kill me. At least, someone send help! Or at least more Timbits, eh?